I hope you are safe and dry wherever you are. And contented. The Mister and I were discussing current events and at one point I shrugged and said, "Same difference." He knew immediately what my next words were going to be: "Hey! My friends who live in my computer will want to know the etymology of that idiomatic phrase!" And I got right on it. The term "same difference" doesn't actually make any sense and is not grammatechnically correct. What you're actually saying is that a thing is not the same, that it is different, but that the difference is so slight as to make it not worth noting, hence: same difference. The earliest known use of the oxymoronic phrase in print was in 1945 in a book titled, "I am Gazing Into My 8-Ball," by New York gossip columnist Earl Wilson. Today my twofers are, in fact, different. This is one of my QACAS (quick and clean and simple) cards that are easy to make and easy to mail. 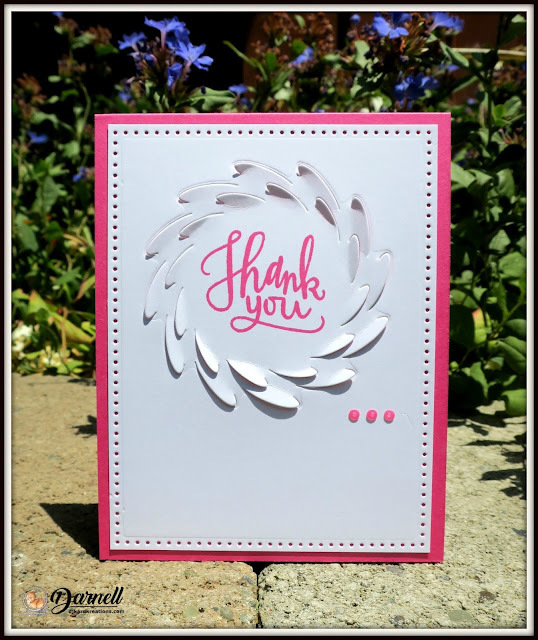 In a large mixing bowl combine a colored card base and a freshly washed leaf of white paper pierced with your awl or an Avery Elle Dotted Die. Gently fold in a NBUS "Swirling Cutwork" die from Memory Box, a sediment inked to match the card base, and three itty-bitty blings. Back to Basics and Beyond: Use an embossing folder. Stamping Sensations: July: In my garden. Love the blousy roses Darnell and the colours too. Can't have roses in the garden as OH hates them with a passion! I just adore that lovely orange for your flowers! Love the beautiful cards. Especially the roses. Fabulous. These are so pretty, both are classy and elegant! Love both of your cards and the design of each one. The roses are beautiful. Two lovely cards Darnell, the fist so stylish in design and the second has glorious colours and so effective with the embossing folder. 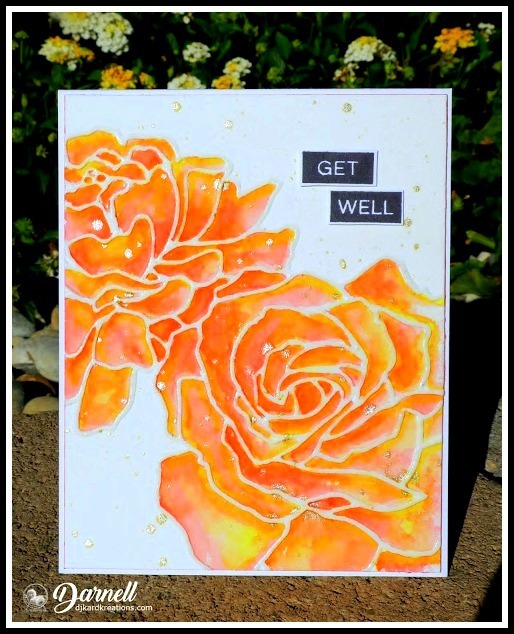 It's really lovely to have you join in at Stamping Sensations 'In my Garden' theme although we are a stamping challenge !! Stunning both your cards and I'm in love with those sunset-colored roses!! Awwww.... I would have roses as these! Hi Darnell, Lovely cards. I especially like the Get Well one. I love them and I think I need to get out my mixing bowl so I can whip up some fantastic cards like you did. Great CASE of Loll's too. I am enjoying the QACAS card! It may be simple but it's still fantastic! And your orange roses are spectacular! Hope the fires are far away from you and wish they weren't close to anybody! well you learn a new thing everyday! You know I love me some CAS, don't do it well or often, but it always makes me sit up and take notice...and this one did. So clean and pristine. Loll's technique (which I did check out...and thank you) sounds so simple but it is obviously so effective. Both her and you cards are a really gorgeous. I'm going to dig out my E/Fs and try it soon. By the way, didn't need Hammy's winking on that beauty. Thanks for reminding me about that swirling cut work die! Love the simplicity of your first card...it needs to be cased. YOur second card is lovely as well. Gorgeous chosen colors, I am off to check out Lolls page. Hugs. What fabulous cards, I'll have to give the roses a try, they are gorgeous! Gorgeous cards and in particular love your caseing Loll's rose. Well there is certainly a lot of difference between these two cards. Gorgeous serene CAS card and then .. wow such a stunning coloured image. Same difference! Hah! I had to laugh as my husband has been saying that for years and now has me saying it too! LOL These cards are different and no way are they the same, but each is equally beautiful, so it's a different sameness, right?! LOL seriously, they're both great, but I love those orange roses - stunning card!! Who knew, I love learning something new when popping into your blog! What a pretty pair of cards. The wreath on the first one is fun but you've blown me away with the second card Darnell ~ WOWZA!! Your swirl-cut die adds some nice interest and dimension to your first card. I love it when a simple idea packs such a big punch. Your rose card is just plain awesome. Although I'm not sure if something can be plain and awesome at the same time. he he It truly is beautiful, though. wish I had that rose embossing folder. I'll have to look through my stack of EFs to see if I have something that would work. Now these two cards are the opposite of same difference, and yet they both have the same effect on me...total awe!! The first one is a perfect example of simplicity and beauty. That Swirling Cutwork die gives just a hint of a wreath (or a dust devil..ha!) and I love the pink and white. As for that floral design...just WOW! We won't tell Hammy that you skipped the wink while he was gone, and we didn't even miss it with those gold splatters. Your CAS style is a pure delight Darnell! Well, I never knew that! Thank you for the definition - isn't it funny how we use expressions and don't really know their meaning! Both cards are beautiful but the second one has really stolen my heart - what a great technique! The colours are simply stunning and your watercolouring is superb my friend! Love, love, love it! Two beauties deluxe! LOVE these!!! Pretty cards .... I think I have that Memory Box die somewhere, must look it up and get it used. The roses on your second card are just stunning .... what a gorgeous colour. Your first card is so delicate and in such fresh, girlish colors. Lovely. And the second card is stunning. I love how you did it according to Loll's instructions. Her films are so perfect and it seems that everything is so easy :-) Such a beautiful card, Darnell. Eeekkk! Two beautiful cards, Darnell! I just received that sweet thank you card... thank you! Two beauties Dolly!! LOVE that gorgeous modern cut wreath for your thank you card. I have not seen that before ... awesome! Darnell, your cards are absolutely gorgeous girl!!! Love both of them! Love the roses! such beautiful colour. Fabulous cards Darnell!! I have the SU EB folder and am itching to try it as soon as can play 'catch up' on my DT commitments.....another fun post!! The Swirling Cutwork looks beautiful on that bright pink cardstock. Your roses are just stunning. I wish I had a rose bush in that color. I'm glad you were able to turn out two lovely cards without Hammy's help. He has taught you well and that's probably why he felt comfortable leaving cardmaking in your hands while he took his trip. Both of your cards are so stunning, Darnell!! The Swirling Cutwork die is so fun!! You used it perfectly!! And WOW!! The second card is jaw-dropping!! The colors are absolutely amazing!! I love, love it!! Wonderful cards! And thanks for the lesson and thanks for looking at my creations. Happy summer, hope it is cooler! Two fantastic cards, Darnell. I especially love the roses and their vibrant colors. Good luck on your upcoming surgery. Prayers and hugs to you. Your first card might be QACAS but that fabulous MB die makes it look awesome! And the roses are really breathtakingly stunning! Absolutely love the colors! Superb cards Darnell! I just adore those roses! The gold splatters make them look dew covered too. I hope you're not missing Hammy too much.. Your QACAS card is so sweet, Darnell! I love the dimension of the wreath and your hot pink accents are perfect! I LOVE your roses...WOW! I'm going to scout my embossing folders and try this technique asap...it's so elegant and your gold splatters really pop on your design! No need to wink it, too...it's just perfect with your beautiful watercoloring! Two beautiful cards and a little tee hee with this post, Darnell! Gorgeous color on those roses. Beautiful garden backdrops for your photos, too! WOW!!! The colors you got in that flower is absolutely gorgeous! I love the oranges and yellows. Perfect Summer Card. Thank you so much for joining us at Simon Says Stamp Wednesday's Anything Goes Challenge. Good Luck! Oh Darnell what beauties - love your recipe for the white and pink card, and that rose one is stunning - you are allowed to CASE a card when it turns out this stunning!! I have used that expression (same difference) for years and never knew it's origins. The color on those roses is breathtaking, Darnell. No winking needed. I love the swirly die cut on the first card too.